Password management has become increasingly more important over the last year. It’s not unusual these days (on a weekly basis) to see a new company report being hacked and customer information accessed, causing passwords to be changed across multiple services. Unless of course, you have a password manager that controls your passwords and form information, while also providing you with multi-layer security over current passwords or those that it generates for you automatically. Password managers are the future of online logins. Sticky Password is an option, as it works across all of your mobile devices, providing you with both password management and form filling. For a limited time (5 more days), you can get a lifetime premium subscription to it through the DL Deals shop for just $24.99. 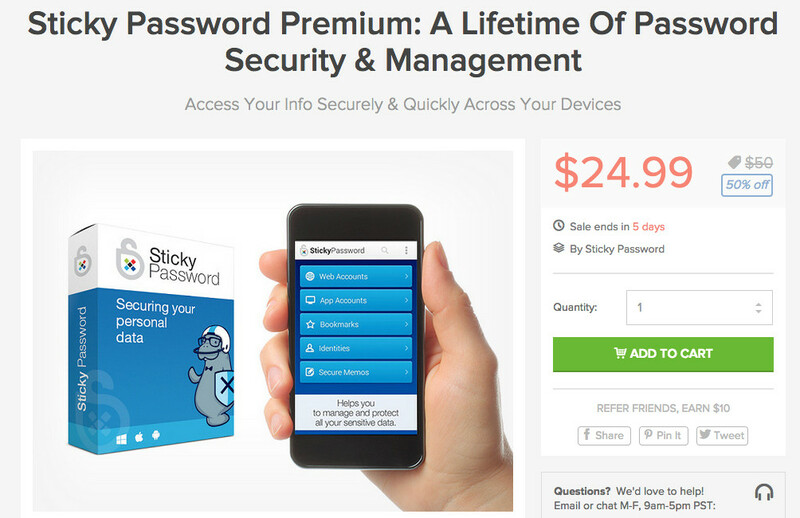 Sticky Password typically charges $12 for a 1-year license, so you can see how this deal is worth it. Sticky Password gives you “strong, unique passwords” whenever you need them, automatically logs you into recognized sites, fills out forms, and should support all of your devices. Again, you only have 5 days left to get in on this deal.